Ok, so I have just three things that need to be actually sold and not given away. I was going to put them on the 'ol Evil Bay but figured I would offer them here first. The first thing up is my Chatterbox Collection, features the book, which is brand new still has the price tag on it ($20), sticker sheets, diecuts, envelopes and snaps/brads. The whole thing sent to ya for $20, well worth over $40. If you are grabbing something from my RAK list I can combine the shipping for both items, just gotta figure out how heavy it will be. The second item is the CK book from a few years ago, has a font CD inside the front pocket. Great for beginner scrappers. $5 and $4 for shipping. 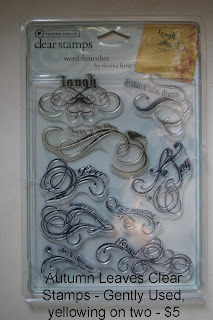 And lastly, these Autumn Leaves clear stamps I used exactly once. I didn't love the acrylic like I thought I would. Two of the stamps have slight yellowing but are still perfect. Original price was $15, now only $5 with $4 for shipping. The shipping is a little higher on these because I want to be able to track them and send them out priority so I can make sure you're getting it, you are paying for it after all. Oh the autum leaves -- love those. Again I am close enough we could save the postage and I could pick them up. Email me: kalyber@sbcglobal.net. Hello! And good luck with the move! Not an easy task! 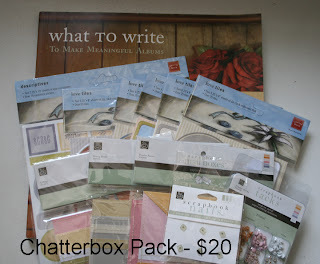 I would like to buy the Chatterbox group! Let me know how much postage will be. I live in Minnesota.